What was the first cell phone ever to carry a built-in camera? 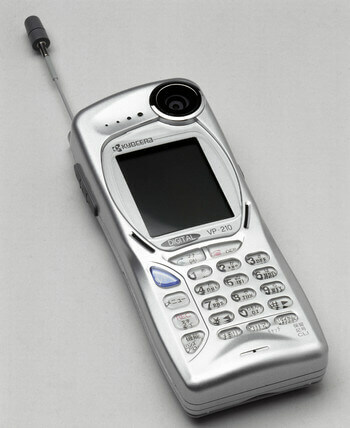 Although it was only sold in Japan for the PHS network, Kyocera's VP-210 VisualPhone began selling for 40,000 yen or about $325 in May 1999, more than a year before the Sharp J-SH04 arrived (November 2000, also Japan-only), which is commonly believed to be the first commercially available camera phone. The VP-210's specifications included a two-inch color TFT display supporting 65,000 colors and a single front-facing 110,000-pixel camera. By comparison, the Sharp J-SH04 had a 256-color display and a rear 110,000-pixel camera. Nokia's 7650 arrived in June 2002 as Europe's first mobile phone with an integrated camera (as well as the first phone running Symbian OS), while the Sanyo SPC-5300 shipped as America's first handset with a built-in camera in November 2002.